A few months ago I was investigating use of a nice 20MSPS analog to digital converter for a high frame rate machine vision system based on the Game Boy camera. Unfortunately the ADC, a Linear LTC1406, comes in a narrow TSSOP form factor. TSSOP is already hard to work with. The pin pitch is only 0.635mm. While I've successfully etched a TSSOP footprint at home, it's at the fringe of reliable home toner transfer etching. Some sort of breakout board is a wiser idea. I had a chance to evaluate three breakout boards recently, and here are the results. 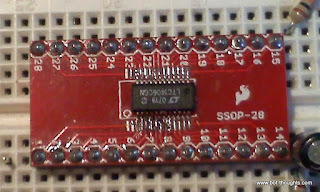 Sparkfun Electronics sells a 28-pin SSOP to DIP breakout board. It looks like a perfectly good board for standard SSOP footprints, but not for narrow SSOPs. 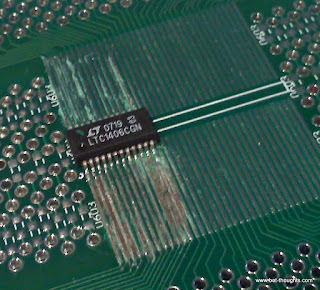 I soldered up the chip on one side and it was just barely reaching to the pads on the other side. In some spots I had to solder in single wires pulled from stranded wire to bridge the gap. If I'd had any other breakout boards available at the time I would not have gone through such a nerve-wrecking, tedious experience. 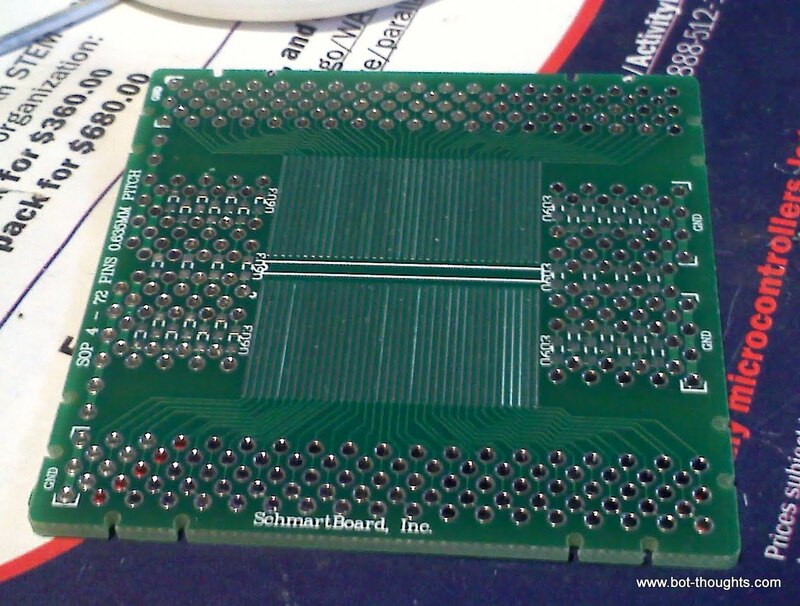 I've really enjoyed using Schmartboard's EZ technology for a variety of chips including tiny SC-70 and SOT-23 ADCs, ARM MCUs in 0.5mm pitch QFPs, Propellers in 0.8mm QFP, and more. 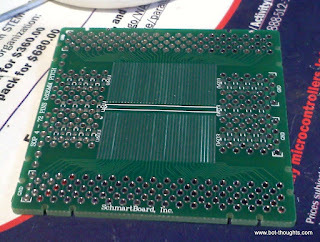 I recommend them to folks intimidated by SMT soldering. Neal Greenberg was kind enough to send along a board for evaluation along with some of their excellent jumper wires so I could prototype my ADC. Thanks! As with all the above, aligning the chip into the pad grooves was a snap. The grooves keep the chip aligned. This is so much easier than a standard SMT footprint where the flight of a passing gnat could knock the thing out of alignment. 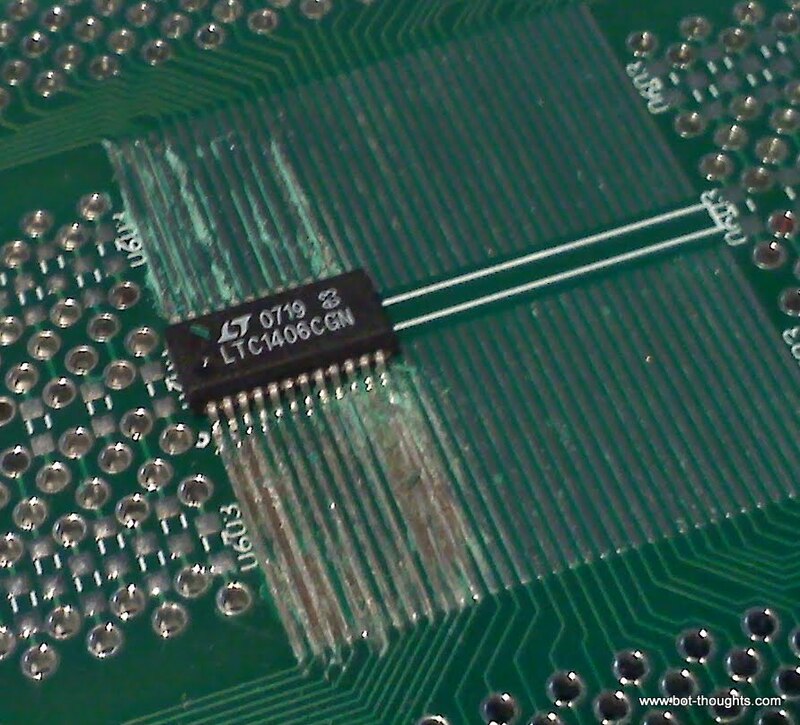 Normally one applies solder flux and then runs the iron down the groove towards the chip leg and all is well. I didn't quite get the technique right. I should've read this review for the proper approach. 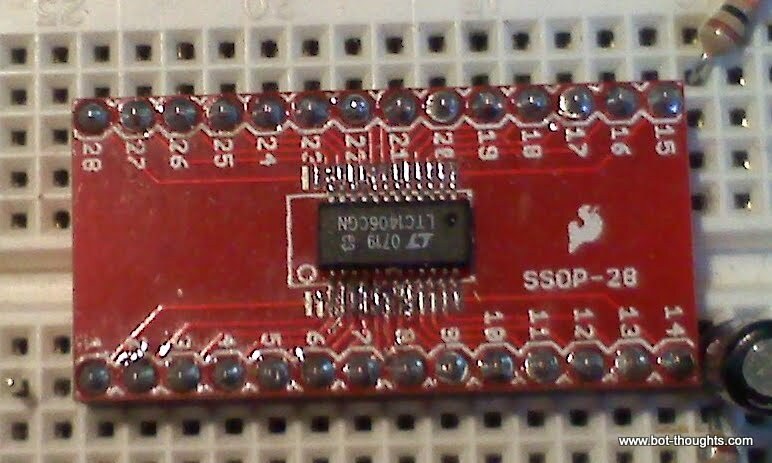 I gouged the solder mask more than actually pushing the solder on some legs and ended up lifting a trace off the board (it didn't break, however). I should've used flux paste instead of a flux pen. And I should've used a hotter iron for the lead-free solder. The good news is that it looks like it'll work just fine but it's really ugly. I still recommend Schmartboard. My flub-up was my fault. I was easily able to solder tiny 0.5mm pitch QFPs a few months ago. In a recent order from DorkbotPDX, a little surprise was waiting for me in the bag; a free pair of TSSOP/SOIC breakout boards where one side has a SOIC footprint and the other, an SSOP. The footprint was just wide enough to cleanly accommodate the LTC ADC. I used my hot air rework station to remove the chip from the Sparkfun board and then soldered it onto the Laen board with my iron. Of the three options this board worked best but requires advanced soldering techniques. 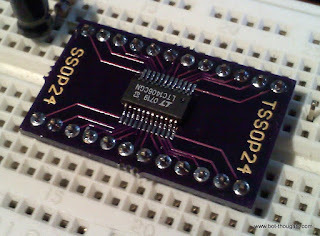 There are other options for TSSOP / SSOP and other SMT breakout boards. One site that seems popular is http://www.proto-advantage.com but I haven't had a chance to look at their SSOP offering.